Betsson can make it easier for their poker players. Here is a suggestion! Image 1. 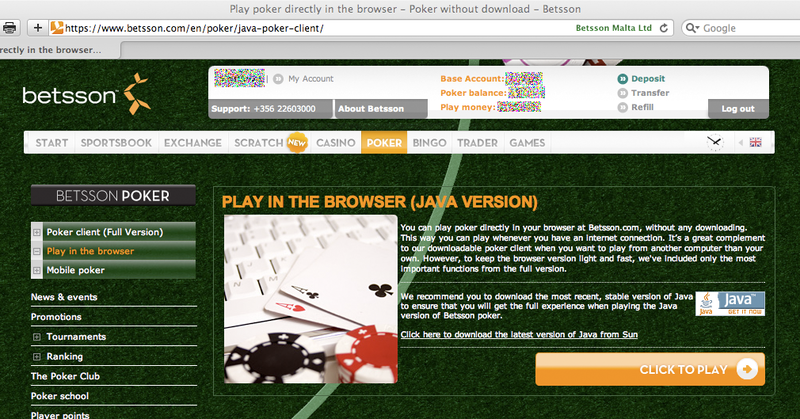 Betsson’s unnecessary step when starting the instant poker client. Betsson should remove the unnecessary step in the player’s user flow when it comes to starting the instant poker client. Today when you click on the “Play in the browser” button on the poker start page you don’t start the poker client, insted you come to a page with information about Java. As a poker player I would expect the poker client to launch right away without this page. Showing this page is good when you don’t have Java installed but not when you have the latest version installed, the the poker client should start insted. Removing unnecessary steps in user flows will be make players happier and they will be able to play faster.